If you thought wars were only waged between Empires, think again! Monsters run amok in Final Fantasy XV: A New Empire’s world of Eos, and it’s your job to get rid of them once and for all. Don’t worry—no good deed goes unrewarded and killing Monsters provides rewards! Next, to your Citadel, you will find an arena called the Proving Grounds. It is here where your FFXV: ANE Hero will valiantly slay the Monsters of Eos and reap the rewards of royalty. Rewards earned from the Proving Grounds range from EXP Boosts and War Items to Epic Craftable Materials and Treasure Chests. Ready to slay some beasts? 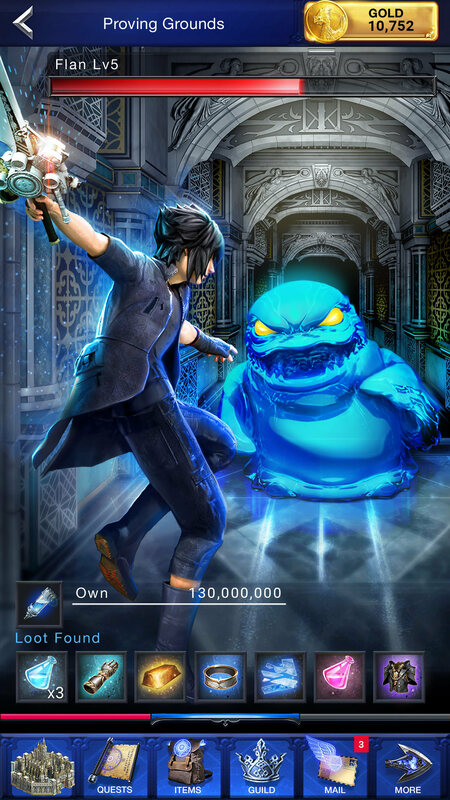 Then head over to your Proving Grounds, in the Final Fantasy XV: A New Empire mobile app tap the Monster to kill and watch as your Hero bravely charges ahead with his Weapon. Simply tap the Monster to hit it. The more powerful your Hero, the better chances you have of Killing the Monster and earning a Treasure Chest! Be careful—once you’ve used all your attacks on a Monster, however, your attack capacity will run out! You can refresh it using Ether, a Special Item found in the Guild Store or earned through Quest Rewards. Already have Ether but don’t know how to use it? No problem! Tap on a Monster when your capacity is maxed out and you’ll be taken to a screen where you can cash in your Ether or purchase more with Loyalty! Happy Monster hunting and good luck!